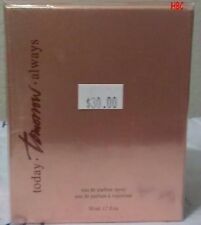 Avon Today from Today Tomorrow Always Series Parfume Spray 1.7 oz . Condition is New. Shipped with USPS First Class Package. 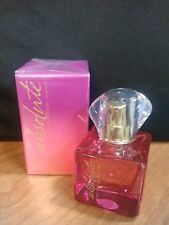 TOMORROW from Avon 1.7oz / 50ml Women's Perfume NIB 2018. Condition is New Unopened. Shipped with USPS First Class Package. Trending at $18.12eBay determines this price through a machine learned model of the product's sale prices within the last 90 days. Fragrance oils in their highest concentration are beautifully blended to create a scent that's truly long-lasting! Mid Note: Orange Flower Absolute Signature, Orris, Hibiscus Petals. A chic floral fragrance as pure as absolute love.an everlasting floral heart of orange blossom with sparkling bergamot and sensual woods. (if it is sealed by manufacturer). All products are fully genuine. Includes 2 sample vials of Today Tomorrow Always. And I throw in a small atomizer as well. Perfect for carrying around in your purse. ~ Pure as Absolute Love. An everlasting Floral Heart of Orange Blossom with Sparkling Bergamot and Sensual Woods ~. ~ New Factory Sealed sold in 2017 ~. Unlike traditional parfums, this bottle does have a spray. Fragrance oils in their highest concentration are beautifully blended to create a scent that's truly long-lasting. Top notes are Calabrian Bergamot, Italian Lemon, Muguet. Trending at $14.02eBay determines this price through a machine learned model of the product's sale prices within the last 90 days. I TRY TO DESCRIBE EACH ITEM TO THE BEST OF MY ABILITY. USUALLY I DO NOT KNOW THE BACKGROUND OF AN ITEM UNLESS I STATE IT. Today Tomorrow Always miniature perfume collection. Unopened. Avon. Bottles are unopened. From my personal collection. Almost all our scents are very sophisticated scents and very feminine. Also, a great scent for younger ladies/girls. Tomorrow Spray. 1.7 fl. Rather, we substitute a new item’s information (cut and paste). But not here at Sha' N' Fashion. Rather, we substitute a new item’s information (cut and paste). This holds down many misunderstandings and case filings. A chic floral fragrance as pure as absolute love.an everlasting floral heart of orange blossom with sparkling bergamot and sensual woods. But not here at Sha' N' Fashion. Be sure to ask about our Tomorrow, and Always. Rather, we substitute a new item’s information (cut and paste). This holds down many misunderstandings and case filings.